Surgical orthopedic implants act as internal aids to normal healing and can’t bear the body weight when the bone is partly healed. Surgical implants have given the ortho surgeon a means of rigid fixation for reconstructive surgery and fracture management. Selection of the Patient: During patient selection the following factors must be considered. Immunological Intolerance:Immunological intolerance can happen in some patient. Where material sensitivity is assumed, suitable foreign body tests should be performed. Degenerative Diseases:In the situation of patients suffering from degenerative diseases, this may get serious during implantation, and will reduce the expected life of the ortho implant. In such cases, surgery may be considered only as a temporary relief. Mental Illness:Mental illness or schizophrenia can cause patients to ignore, the limitations and precautions of the implanted material, resulting in implants fracture and complication. Alcohol and Drug Addiction:Patients who are in addiction to alcohol and drugs can ignore during the state of stupor or during the stage of withdrawal, the essential precautions for the usage of implants. This can result in complications of failure of implants. Obesity:An obese patient produces abnormal stresses resulting in an increased load on the implant which ultimately results in implant failure. Selection of the orthopedic Implant:For successful implantation the choice of the proper size, shape,and design of the implant is essential. The shape and size of the human bones limitthe size and strength of implants while performing fracture management and reconstructive surgery. The doctor/Orthopedic Surgeon must choose the suitable implant depending upon the application. Handling of Implants:The plate should adapt to the bone shape, and any inequality should be adjusted by the correct shaping of the plate before it’s fixed. The technique of utilizing the screws to bend a plate to fit the bone isn’t recommended as the screws are instantly subjected to a strong expelling force. So, plate contouring should be done by the plate benders intended for this purpose. Care should be taken that there are no distortions notches or scratches, sharp dents or reverse bends at the screw hole site. These can cause defects on surface finish and lead to improper bonding. Unstable: Bone plates even if bent and properly fixed can fail due to fatigue and break. Breakage can be because of unstable implant fixation or inadequate support. If the screw isn’t properly centered as it is being tightened, there will be a tendency for the countersink in the plate to force it to one side, thus damaging the good threads already cut in the bone and creating a strain which will probably result in necrosis and the screw’s early loosening. Removal of Implant:The surgeon must take the ultimate decision on implant removal. It is suggested that the implant utilized as an aid for healing should be removed once its services are over, mainly in younger and more active patients. Post-Operative Care:A patient should be made alert of the limitations of metallic implants and take precautions to avoid needless stress to implant. No partial weight bearing or non-weight bearing device may be expected to bear the unsupported stresses of excessive muscular activity or full weight bearing when there is an ununited fracture. The bone union is a must and the patient must limit his activities to support in healing. Second Hand Implants:Used implants which appear un-damaged canhave external and internal defects. It’s possible that individual stress analysis of every part may not disclose the accumulated stress on the metals. This can result ultimately in implant failure. Every orthopedic implant must be discarded after use and should never be re-utilized. They should be bent & then disposed of correctly so that they are unfit for reuse. While disposing of, make sure that the discarded implant doesn’t pose any threat to children, stray animals & environment. Incompatible Combinations: Implant components from one manufacturer shouldn’t be utilized with those of another. Implants from every manufacturer can have design and metal differences, so that usage in conjunction with the different device could result in inadequate fixation or corrosion of the implant because of generation of piezo currents. Packaging Disposal:The device’s packaging material if swallowed cancause choking hazards. Thus, it should be disposed of in such a way that it’s out of reach of stray animals and children. Use:Orthopedic Implants should be utilized by Specialized & Qualified Trained Surgeons Only. Siora Surgicals Pvt. 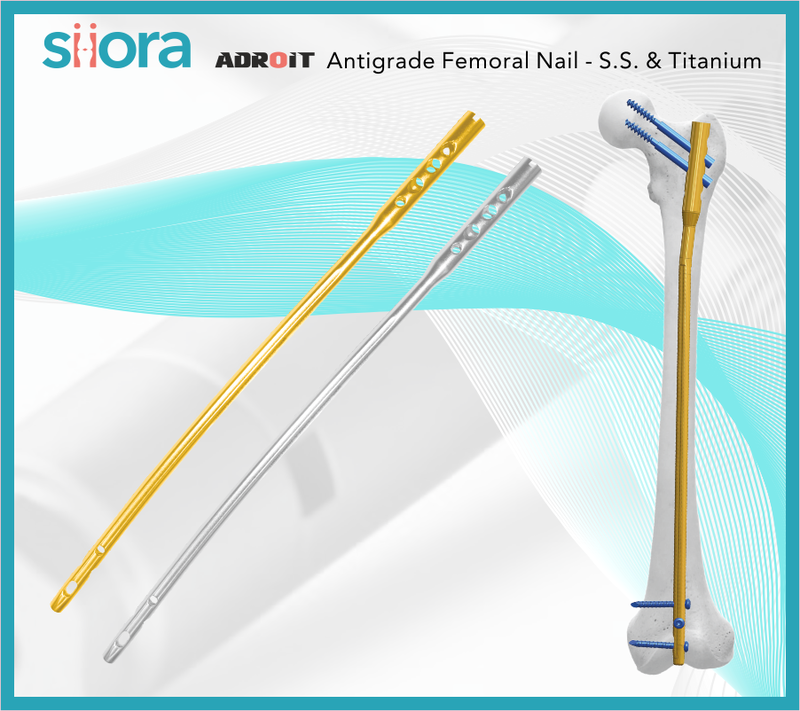 Ltd is one of the top orthopaedic implants manufacturing Company in India. We have different type of orthopedic product such as Small Fragment Locking Implants, Hip Prosthesis, Interlocking Nails, Bone Screws, Locking Plates, Trauma Bone Plates, AFN Nailing System, Cannulated Screws, Large Fragment Locking Compression Plate, Mini Fragment Implants, Multifix Tibia Nails, Intramedullary Interlocking Nails, Proximal Femoral Nailing Antirotation, Dynamic Hip Screw, Dynamic Condylar Screw, Angled blade plates etc.